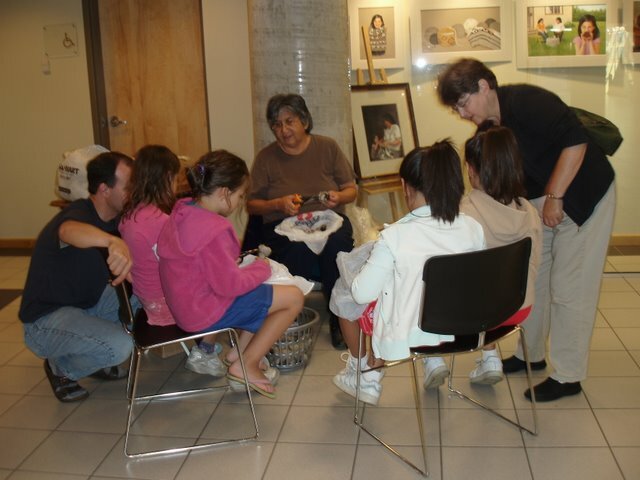 Visitors to the Mary Winspear Centre in Sidney made pom-poms with Coast Salish knitter, May Sam. 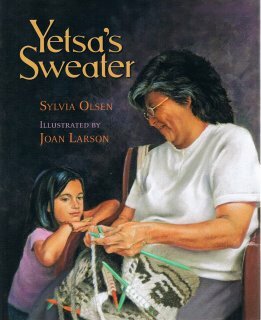 The artwork in the background is by Joan Larson and was used in Yetsa's Sweater. Sylvia Olsen modelled some fine items of Cowichan knitting during a presentation to students from Deep Cove Elementary School. Her antics were part of the weeklong book launch of Yetsa's Sweater. May Sam, seated nearby, shared her own stories of learning to clean the fleeces, card, spin, and knit the wool during a lifetime spent working with wool. Children learned to make pom-poms in the same style that May made them when she was little. The artwork hanging in the background is by Joan Larson, the illustrator for the book. The machine peeking out from behind Sylvia is a spinner, made from a modified treadle sewing machine. 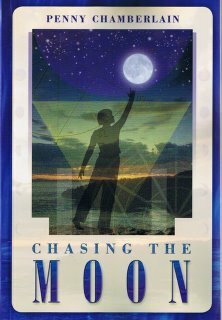 Chasing the Moon is Penny Chamberlain's new work of historical fiction for young readers. I mention it here while wearing my Freelance Publicist's hat to let everyone know to attend the book launch this weekend. Penny's book is one of two being featured in a weeklong series of school visits, public displays, signings, and launches organized and hosted by Sono Nis Press (the second book is Sylvia Olsen's new picture book, Yetsa's Sweater - I'll post a cover scan in a minute). Big publishers take note! This kind of all out support and promotion of new titles is rare, rare, rare and is yet another reason why I appreciate the work of Sono Nis. The books are gorgeous and Diane Morriss throws herself behind every title she produces. She really is the heart and soul behind the 'little press that could' even when the publishing industry in Canada suffers its share of troubles. And here it is, Yetsa's Sweater by Sylvia Olsen and illustrated by Joan Larson (the same artist who will be doing the new StableMates covers, in fact!) Yetsa's Sweater is a lovely book about the tradition of making Cowichan Sweaters. Sylvia's launch will be on Thursday evening (Sept. 28th from 7-9 pm) at the Mary Winsear Centre. May Sam (the model for the grandmother in the illustrations) will be on hand doing some sweater-making demonstrations. Yetsa (Sylvia's grand-daughter) will be there being both cute and famous, and Joan Larson (along with a selection of her artwork) will also be in attendance. Come one, come all! Should be a great time... If I get myself organized, I'll take photos and post them here, so you can see what you're missing! Can you identify this bird? A raptor is about as much as I know... The photo was taken above a vineyard near Cobble Hill on Vancouver Island earlier this year (they day we took Dad out for a tasty wine-enhanced lunch for Father's Day). I'm mostly uploading this as a test of my internet connection from my laptop and apparently the most recent photos stored here aren't that recent. I kind of like the photo, though - I got quite dizzy the day I took it as I was sort of stumbling along with the camera pointed straight up, one eye closed, the other peering through the viewfinder, trying to catch the bird as it soared above me... Hmmm... that really doesn't sound good, does it. Seriously, I only had a very small quantity of wine... not really enough to result in stumbling across the vineyard, dizzy and unable to identify the local birds. One of the (many, many) strange things about life is its persistent nature. After someone dies, life keeps on going for everyone else even though it seems impossible that this could be true. 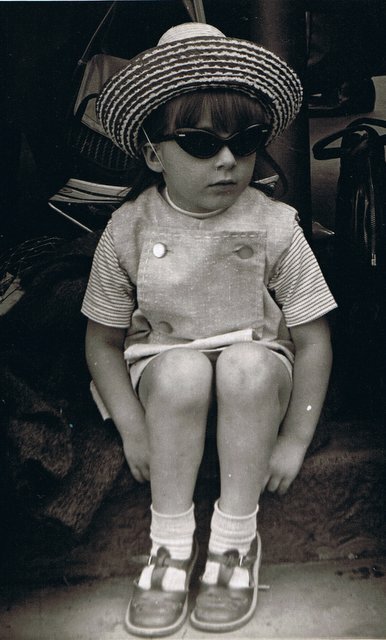 I know, every armchair philosopher on the planet has mulled over this whole mortality business - but I must say that despite knowing my mother's death was coming (she was ill for a long time), the finality of her passing has left me in a bit of a surreal daze. The museum is a pretty cool place to hang out - very casual, lots to see. The model train people also use the property and they had their small trains running (large enough for people to sit on, though the engines barely come up to my knees). At some point, I started wandering around in the hidden corners of the place where the as-yet-unrestored bits and pieces of machinery, old wagons, tools, sawmills, ploughs, and other amazing stuff are stuffed into sheds and barns and shelters and I had this flashback to driving around to old farms in Alberta with Mom. She spent hours and hours and hours poking around decaying homesteads, photographing rusty ploughs and rotting vehicles and I started seeing things completely differently. Next thing I knew I was grovelling around underneath some horsedrawn carts, snapping away, having something like an out-of-body/not-my-memory experience as I imagined what Mom would have photographed had she been there. WILLIAMS, Helga, (nee Wallraf) (The Word Lady), was born in Halle, Germany October 10, 1939 and passed away on September 6th at the Saanich Peninsula Hospital after a lengthy illness. Helga is survived by her husband, Colin, daughters Nicole and Tonya (Bart), sons Peter and Sascha (Peta), and grandchildren Danielle, Brittney, Cydney, Alysha, and Toby as well as her sister, Hanni (Wolfgang). A love of travel took Helga around the world and back, always seeking new adventures. She and her family lived in England, Australia, and the United States and, after immigrating to Canada in 1969, Banff, Calgary, Fort McMurray, Vancouver, Salt Spring Island, and Victoria. A professional photographer and writer (in addition to many articles and columns she was also the author of Wordplay, illustrated by her husband and published by Sono Nis Press), Helga was also a fabulous teacher. Her photography and ESL classes were not just informative, they were also a great deal of fun. A Scrabble champion and founder of the Victoria Scrabble Club, Helga’s knack for knowing just the right word was legendary. 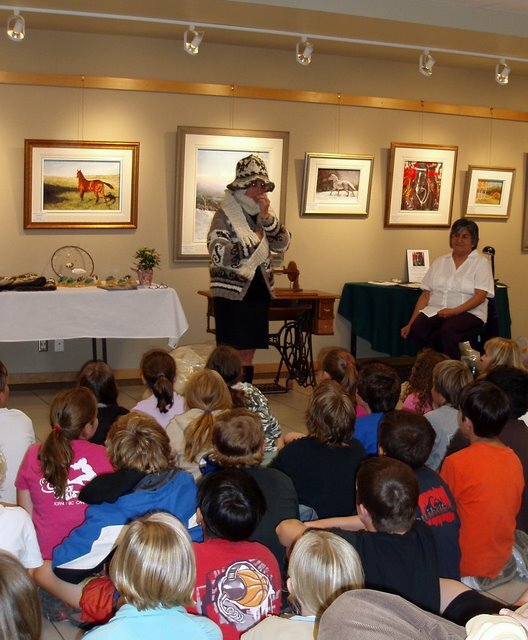 Victoria residents enjoyed her CFAX appearances and looked forward to her Wordplay columns in the Times Colonist. Helga’s weekly “International House of Music” broadcasts on CJOK radio in Fort McMurray entertained listeners for several years. Helga’s sense of humour and love of life will be much missed. A passion for music was a constant in her life and not long after her move to Victoria she became a member of the Gettin’ Higher Choir in Victoria. The choir, the music, and the friendships she developed in this community of song played a central role in her life in recent years. The family would like to thank all the staff in ECU at the Saanich Peninsula Hospital for their dedication and many kindnesses. In lieu of flowers, donations, if desired, may be made to the Gettin’ Higher Choir Scholarship Fund – Helga’s Legacy, 1305 Bond Street, Victoria, BC V8S 1C3. If you knew my mother and would like to visit her online guestbook to leave a comment, here is the link. Aly and Dani hanging out in the hay mangers of the horse trailer at last weekend's horse show in Sooke (Behind the Scenes at the Horse Show?). This was Aly's first show - she and her pony Emma (peeking out over the ramp) competed in pole bending, trail class, English pleasure, English equitation, tack and turnout, and barrel racing - all in the leadline division. This means that a very hot, huffy-puffy Auntie Nikki did a lot of running around in the sun at the other end of the leadline while Aly chortled and bounced her way through all her classes. Great fun for all and Aly came home with a fistful of ribbons and two trophies! Quite a haul! Clydeslades at the Saanich Fair! Team Bickford at work! Perhaps one day these fellas will make it into a book on draft horses? I love these heavy horses - there is just something, you know - hefty - about them! Good news on Friday (before I headed off to the fair with a single Clyde from Bodicea shoe-horned into my two-horse trailer...) - things are going well on the racetrack book. Apparently the cover design is coming along nicely (it's tough to try to capture various types of racing, back-stage type stuff and all that while still looking sharp enough that a kid will pick the book up). Can't wait to see it! I also learned that unlike my earlier impression that the whole book was being designed before the text was finalized, actually just a single double spread was being worked on so everyone gets a good idea of what the book is going to look like. Meanwhile, over on the editing front, it doesn't sound like there will be major changes to the text, so we are heading fast toward the copy-editing stage. It's always exciting when things move ahead and the book starts to become more real. Of course, copy-editing can mean some tedious, nit-picky changes that seem very innocent but that can cause a huge amount of work to resolve. I recall a certain question raised by an editor about the actual eyebrow colour of redheads. My 'copper-coloured' description was deemed 'unlikely' by the editor, so I wound up doing an exhausting investigation involving many hair salons... My favourite response from a stylist (who clearly thought I was a bit soft in the head for asking) was, "That's a really silly question. Everyone knows red-headed people don't have eyebrows." Oh really? I have had many beg to differ since. Of course, there is Double Take to finish up. Karen's biography is missing only the last few interviews with coaches, etc. but then it can go off for editing - and then maybe Hollywood? Karen is competing in an Olympic qualifier over on the mainland this weekend - looking forward to hearing results next week when she gets back. An on a final horsey note, congratulations to Canada for bringing home the gold in Aachen at the World Equestrian Games in Reining! Woooo hoooo!